Wallpaper Engine is an early access application on Steam that enables you to create, display, and share customer static and animated wallpapers. I stumbled upon Wallpaper Engine while browsing the top sellers on Steam. The app was listed there next to games, and that got me interested as it takes quite a bit of sales to be featured there. First of all, Wallpaper Engine is not free. It is available for $3.99 as an early access title. The application works really well for early access software, and all core functionality is already there. The app ships with wallpapers, and support for the Steam workshop. There you find thousands of wallpapers created by users of the app. The majority of those are free, while some are available for a price. I decided to embed a video above and not a screenshot, as it highlights better what Wallpaper Engine is capable of. Once you have purchased the app on Steam and installed it, you can start it up right away. The app walks you through a couple of settings first that define wallpaper quality, startup, and the interface language among other things. The interface of Wallpaper Engine is divided into two main parts when it comes to browsing and selecting wallpapers. Installed lists all wallpapers that are installed already. The app ships with 13 wallpapers, and any that you install manually is listed there as well. 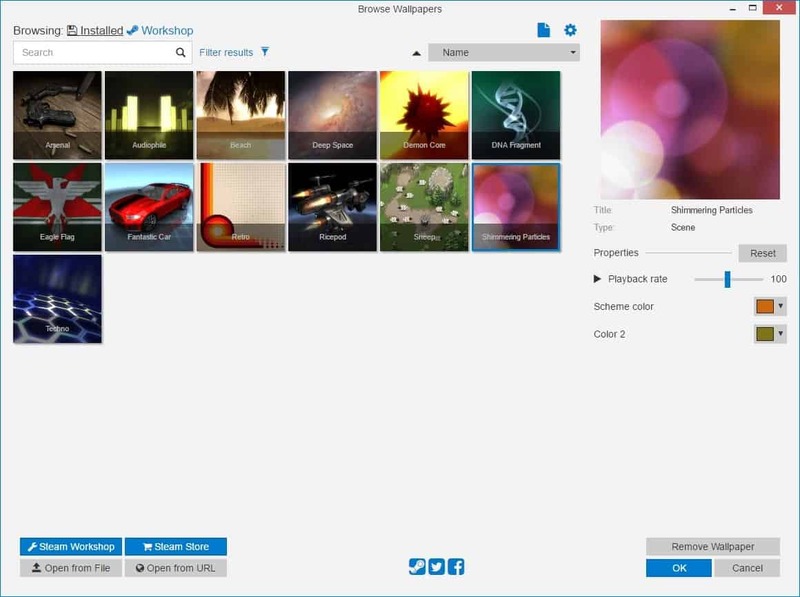 Workshop lists all wallpapers that are available on the application's Steam workshop page. Preview any wallpaper by selecting it. This opens a larger preview of it, and several properties that you may adjust. This includes, usually, the playback rate, and colors. You may use the remove wallpaper, ok and cancel buttons to apply or remove wallpapers from the desktop background again. Animated wallpapers on the desktop are not nothing new, Microsoft introduced the feature as one of the few extras for Windows Vista Ultimate, and programs like VLC or Desktop Movie support it as well. The teaser trailer embedded above highlights some of that. It shows a wallpaper that visualizes the music that is playing on the system, a wallpaper with game elements, and other forms of direct interaction with the wallpaper. You can check out all available wallpapers on the apps' Steam Workshop page. 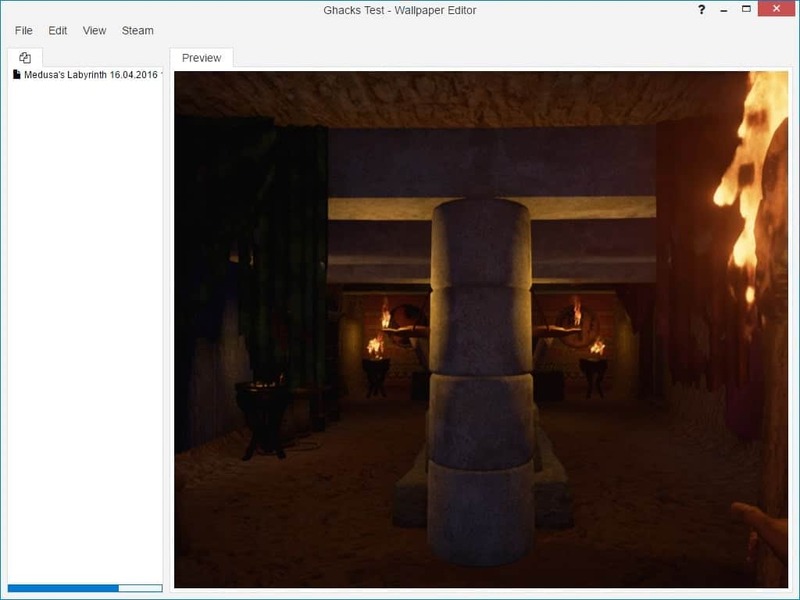 The app supports multi-monitor environments, and different aspect ratios and resolutions. Also worth noting is that it won't modify any system files for its functionality. It will pause wallpapers automatically when games are played on Steam, and you may run any app or game in parallel with the software as well. Performance depends largely on the selected wallpaper and type. It should be clear what application and website wallpapers will use more resources than lighter 2D or video based wallpapers that don't support interaction with the wallpaper. You may switch between different quality levels in the settings, and modify a lot of quality related settings there manually as well. The app uses a surprisingly low amount of RAM. It used about 11 Megabytes of RAM when I loaded an animated wallpaper called universe, and 12 Megabytes when I loaded the one called Techno. The interactive game wallpaper Sheep on the other hand required more than 60 Megabytes of RAM. Wallpapers remain open only for as long as the Wallpaper Engine software runs. When you close it, the wallpaper is closed with it. You may create wallpapers using the software, and may upload them to the Steam workshop as well once you are done. Right-click on the application's icon in the system tray area to get started, and select create wallpaper. A welcome prompt asks you to pick the type of wallpaper that you want to create. Available at the time of writing are scene wallpapers, video wallpapers, web wallpapers, and application wallpapers. Scene wallpapers -- Import 2D or 3D images / models. Video wallpapers -- Load a video file that you want to use as the wallpaper. It is looped automatically. Application wallpapers -- Run an application, e.g. a game, as the wallpaper. Wallpaper Engine is a fantastic application for users and creators alike. As a user, you get to choose between thousands of wallpaper images, many of them animated or interactive. You can also create basic wallpapers quickly using the built-in editor. Creators with knowledge of the required scripting and programming languages can create interactive wallpapers using the same built-in tools. Wow awesome! Nice to Stardock’s Deskscapes has some affordable competition! When did you introduce HTTPS, Martin? It is just enabled as an option right now. Will make the switch eventually. Hmm, then it seems the latest HTTPS Everywhere update (from yesterday) introduced a rule to your website. It has lots of options to choose from. Low on CPU (the program itself; what you actually load as wallpaper can eat up CPU usage). Steam workshop allows you to upload *.exe files and this program doesn’t filter those out. However, it will warn you about them tho. Workshop filter not so great. Can’t read or send reviews of wallpaper from that app (just a star rating). For the price, and CPU usage. It’s one great app.